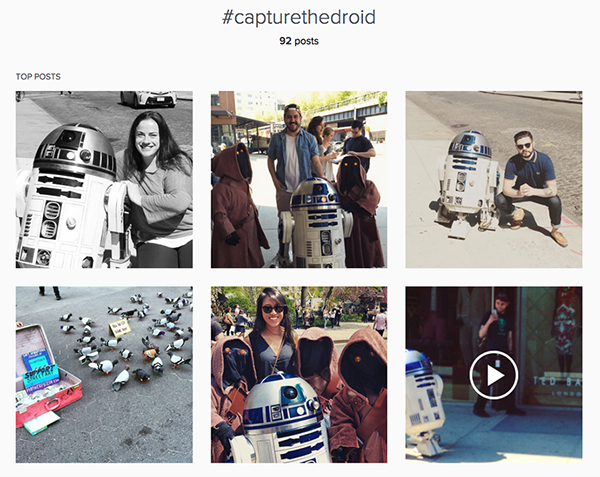 #CaptureTheDroid was a Star Wars Day event. The fans can watch 3 stop-motion videos featuring R2-D2 and Jawa figurines and win a trip to San Diego Comic-Con. Each video ended with a clue leading viewers to enter an online sweepstakes. The fans who found the droid/R2D2 and said the secret passphrase won incredible prizes, including exclusive Star Wars merch, DROID Turbos, and a trip to San Diego Comic-Con. #CaptureTheDroid was a Star Wars Day event. The fans can watch 3 stop-motion videos featuring R2-D2 and Jawa figurines and win a trip to San Diego Comic-Con. Each video ended with a clue leading viewers to enter an online sweepstakes. The fans who found us and said the secret passphrase won incredible prizes, including exclusive Star Wars merch, DROID Turbos, and a trip to San Diego Comic-Con.